Of course we’ve always known that the more-transgressive-than-thou, libertarian free-spirits of the Aussie media are for the most part just conventional folks putting on a show. But the word is now out: in support of decisions not to republish the famous Danish cartoons in their own papers, these people now whisper that they have, ah, families. Who would have thought? More on the Aussies below. But it’s worth noting first that the fabled bohemians of the UK intellectual Right, though in much the same boat, have at least shown themselves to be slightly more inventive. In explaining its decision not to publish the cartoons, the conservative UK magazine TheSpectator doesn’t mention families (registration required). (OK, this may be wise given the level of bonking that notoriously goes on there). Instead, the magazine editorial on the cartoons mentions its concerns about – would you believe – the tea ladies. Of course, for moderate and secular Muslims facing Islamicist crazies in their own countries, this kind of thing from an influential Anglo publication like the Spectator is not all funny but very bad news indeed. do believe in them but are, well, sensible about the thing, old boy. This was the point the Islamicists wanted to make above all in their well-orchestrated campaign, and of course they’ve made it exceedingly well throughout the Anglosphere. For sheer good ol’ British hypocrisy though, the Spectator is hard to beat. In the same editorial in which it stoutly defends its own decision to be sensible and not publish the cartoons, it attacks bishops who it alleges have failed to assert Christian values in the face of a Muslim cultural onslaught; and police who it alleges have ‘bottled out’ of enforcing the law when it comes to Muslim protestors. Hey Spectator. Don’t bishops and policemen have tea ladies too? Little point? No point at all, really, provided of course that you can live with the betrayal of the moderate Muslims you claim falsely to be protecting. Some of these are quoted by Henderson himself in this very article, including the Egyptian Muslim journalist Mona Eltahawy, who wrote in the International Herald Tribune that she supported Jyllands-Posten’s right to publish the cartoons of the prophet Muhammad. This moderate Muslim said she found “the daily human rights violations of our [Muslim] dictators to be more offensive to the memory of the prophet’s life than a few cartoons could ever be”. Just writing this should make Henderson feel queasy. He would know that if you only stand up for your principles when they ‘make sense’, they’re no longer principles. And why is ‘this instance’ different? What happens next time? Cowardice (sorry: ‘pragmatic judgements’) tends to be habit-forming. If they have been honest enough, it’s a pity Henderson spills so much fatuous ink trying to rationalise spineless timidity with the ludicrous proposition that it has something to do with protecting moderate Muslims. The opposite is the case, and for this we’re all going to pay enventually, one way or another, tea ladies and all. This could be bigger than Rathergate, Ben Hur or the Coming of The Great Blue Wombat to the Wunga Wunga People’s Billabong in the Dream Time. Looks like the Egyptians gypped us… They published the cartoons in October, and the rage and outcry was…. ZERO. So what is all the fuss about then, and why can Egypt boycott Denmark when they are guilty of exactly the same thing ? More guilty actually, because unlike in Egypt, the Danish government does not rule by decree and cannot punish journalists on a whim. Crash takes exception to strong language (He should take a look at the welcome message over at Silent Running sometime). But there is a time for all things, as surely as Ecclesiates says. There is a time for sensibilities, and a time to stand up and be counted. There is a time for civility, and a time for offense. This is where I come in. So, I say Merde! Kufr Aleikum! and Get a Big Pig Up Ya ! to our ROP friends that have been rioting, threatening, boycotting, torching embassies and bringing down online domains. The ROP are not the only ones with an Ummah. Not to worry, Censorin’ Christian Crash, its already censored ! UPDATE (CRASH): Looks like I don’t need to edit anything. Wombo seems to have technical difficulties. Everything seems to be in order. Oh, and Merde seems like the French word for the Spanish word Mierda. Don’t need to lookup it’s meaning. Gekko would like to point out in his lizardly way that, provided the Australia media keeps the national economic interest properly in mind, the Danish cartoons affair could turn into a windfall. You know it’s true: what we have here is the biggest Danish-substitute Aussie export opportunity since Mary Donaldson! Aussie dairy farmers have been doing fairly well out of growing markets in China and India. Now they stand to clean up not only in the Middle East but right across the Islamic world. The blunder of the Fairfax papers in NZ in publishing the Danish cartoons has been an extra stroke of good luck – though it’s true that it may also do some collateral damage here. NZ dairy giant Fonterra’s acquisition last year of the century-old Bonlac coop in Victoria means that Bonlac brands run the risk of being tarred by the black Kiwi brush, and frozen out of the coming action in the Mid East. No matter: Fonterra’s great vision of creating an ANZAC dairy giant to take on the world may be looking a bit sick, but that won’t hold us Aussies back! Iran alone buys more than $90 million worth of Kiwi dairy products every year. This could all now go to Australia! Think about it: Kiwi-substitute action on top of the Danish bonanza! This will be more fun than under-arm bowling! Fonterra should now forget about buying the big Dairy Farmers Coop in NSW that they’ve been eyeing for yonks. When Dairy Farmers floats on the ASX within the next couple of years, it will be an all-Aussie affair. For investors who can’t wait that long, the best play right now is to get out of New Zealand and reinvest in Philippines conglomerate San Miguel Corporation. The Filipino group acquired Australia’s National Foods, along with its Pura milk and King Island creams and cheeses brands, among others. Mind you, the Aussie media will have to stay strong in their lovely sell-out mode. Sure, Ibn Warraq, a well-known Islamic dissident writer, wrote in Germany’s Der Spiegel that ‘unless we [i.e. the media] show some solidarity, unashamed, noisy, public solidarity with the Danish cartoonists, then the forces that are trying to impose on the Free West a totalitarian ideology will have won; the Islamization of Europe will have begun in earnest.’ But so what? Provided the Aussie media can resist the advice of the Ibn Warraqs of this world, in Cairo tomorrow they’ll be clearing the shelves of French Yoplait and replacing it with Aussie Ski yoghurt! Go Aussie go! The AWB gave up a few hundred million bucks for some wheat deals; are our media’s free speech principles too high a price to pay for the biggest dairy market in the world? You gotta be kidding! At the time of writing, not a single cartoon of ol’ Mo has appeared in any Aussie newspaper! Keep it up guys! Of course some Muslims in the Middle East actually take seriously all that stuff about free speech that you hear from Ibn Warraq and his ilk; and that we carry on about in our editorials and at civic receptions and parliamentary openings and the like. 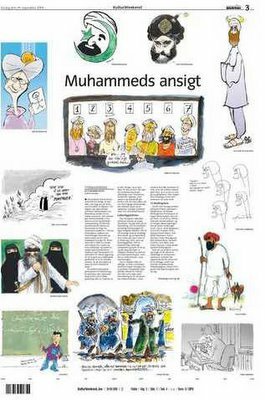 In the midst of the cartoons furore, one Muslim publisher – name of Jihad El Momeni –actually reproduced three of the Danish cartoons in the weekly Jordanian paper that he edits, called Shayhan. He was fired and King Abdullah II of Jordan, who happened to be touring the US, remarked from Washington that he would be ‘punished’. There’s no need for Aussie media people to feel bad about not supporting the likes of losers like Momeni. All they have to do is follow the example of CNN, who, after reporting how Momeni risked his life in support of free speech, added the wonderfully prim line: ‘CNN has chosen to not show the cartoons out of respect for Islam.’ It’s that easy! There are also a number of secular Islamic bloggers in the Middle East who have not only criticized their co-religionists for their cartoons hysteria, but have actually mounted an internet ‘Buy Danish!’ campaign in the Middle East. Can you imagine? In Egypt, ‘Big Pharaoh’ is one such blog; ‘Freedom for Egyptians’ is another. There are plenty more. Hey, talk about guys in pygamas! These are the same people who carry on about the persecuted Christian Coptic minority every time a few local Islamic boyos torch the local church on a Saturday night and kill some Copts, as they did again on 18 January this year, in the village of Edyssat near Luxor in upper Egypt. 700 years or so ago, the Copts were the majority in Egypt. Now they’re down to about 10 per cent. More losers! Talking about Islamic-Christian relations, King Abdullah touched on that subject as well in Washington last week. Showing the hilarious sense of humour traditionally associated with colorful desert despots like himself, he remarked that relations between Muslims and Christians in the Middle East were ‘a 1,400 year long tradition of friendship’. Funneee! Gekko has never laughed so much! But Abdullah’s conservative American audience reportedly accepted it without the slightest demurral – and so should we. To those who object, Gekko, pausing on his way to the bank, will have only this to say: MOOO! 1. An unclean animal like a dog is unfit to share your home but is shown living with a man in the Wallace and Gromit cartoon, which is an offense to Muslims everywhere. The fact that Wallace is shown eating cheese that is likely made in New Zealand where the Mohammed cartoons were published, is a further, intentional affront to Muslims everywhere. According to the hadeeth of Ibn ‘Umar the Messenger of Allah said: “Be different from the mushrikeen: let your beards grow.” However, in “A Close Shave,” it shows Wallace shaving his beard, which is yet another intentional insult to Muslims. Nick Park has intentionally made these plasticine figures to offended Muslims and must pay. If Nick Park does not apologize to Muslims everywhere and immediately burn all Wallace and Gromit animations, I issue a fatwa to boycott all English products and burn their embassies. 2. The cartoon Cathy shows a woman wearing western style clothing and freely questioning her man. If Cathy does not immediately put on a burqa and submit to the authority of her on again, off again boyfriend Irving, I declare a fatwa on the Zionist cartoonist Cathy Guisewite that she should pay for intentionally offending Muslims everywhere. Also, this fatwa extends to Universal Press Syndicate for publishing the Cathy cartoon and, while I am at it, extend the fatwa to Kansas City, Missouri (note: Kansas City, Kansas is exempt from this fatwa as things cannot get much worse there). 3. I think Warner Brothers should feel the wrath of the Muslim Borthers for their portrayal of a pig in their cartoons. Obviously, in 1935, Friz Freleng and the other Zionists intentionally drew Porky Pig to offend Muslims. The fact that he used an unclean dog to control the cats that were hunting mice in the episode “Trap Happy Porky” is doubly insulting to Muslims everywhere. We insist that all Porky Pig cartoons be immediately withdrawn from worldwide distribution and that Warner Brothers Studios apologize to all Muslims or a fatwa will be issued to burn down their stores in Westfield Shopping Centres worldwide (If the fire spreads to adjacent Disney stores, that is okay as we Muslims are not too happy with the unclean dog Pluto either). Hi…Cane Toad here. When I was asked to write for this blog, I jumped at the chance. However, a few of my friends wanted to be included…how could I say no. I told them that this would be a fair analysis forum, open to well thought discourse. They responded that they always are fair and willing to listen to others. They will look at news stories in the Sydney Morning Herald and discuss them with me and I will write up their comments. Just the other day, I asked Joanne (from Minto) about her thoughts on Hamas. She responded, “isn’t dat sh** just made out of chickpeas.” What a sweet girl. For an ALP supporter, I think this is well thought out discourse, don’t you? Okay, an introduction is in order. I put up their pictures with a little blurb about each one of my friends. Hello, here is a picture of me and my fully sick mates having a bit of fun. I cannot believe we had time to do this on Monday night…wait, none of us work (thank you ALP), and so Monday night is just like any other night. Hobbies: Attacking police at peace rallies. Dropping marbles at an animal rights rally so the police horses fall and are injured. Watching armpit hair grow. How can you enjoy your life when innocent children are starving in the world? Hobbies: Playing for money in circ quay, complaining about how the abos got screwed by the British. The high gas prices are making it harder for aboriginal community as we can no longer afford to sniff the premium petrol. Hobbies: having a fourth child before she turns the ripe old age of 23. Don’t f*** with me, just tell me the quickest way to the Centrelink offices and the pokies. Hobbies: Finding ways for the west to become more peaceful like the misunderstood Islamic people. Greetings, it is a most arduous task to remain optimistic in a world with George Bush that is in juxtaposition to the postmodern interpretation of power in a worldwide dialectic. Several weeks ago, DhimmiWatch/JihadWatch brought to my attention the report that the Pope does not believe Islam is capable of reform. However, after seeing that the Washington Times has at long last picked up on this, I thought this story worth unearthing. Seems that I judged poor Benedict too soon. He may the most prominent mainstream anti-Dhimmi out there. It is also bleedingly obvious that the Pope and I agree on at least one matter without question. UPDATE: Seems like Father Fessio misheard/misunderstood. The Pope said that the Koran was beyond reform, not Islam. Sorta like Catholacism…anyone remember the Diet of Worms? I am a hard to pidgeon-hole. Who am I: I am a minority (very much so), I am conservative, I am a Christian (of the conservative protestant flavour) and I am a lover of beautiful maths. Where I live: The WEsT SiDe! What helps me pay the bills: I provide quantitative consultancy services…and no I don’t need more work! What you can expect from me: sarcastic short posts, the odd topical post, general upkeep of the blog, loads of spelling mistakes, misquoted phrases and idioms and some serious lefty-sledging! What I loathe: Lefty self-pity and suicidialism and stubborness (the latter of which I suffer from).